- "God is a Spirit: and they that worship him must worship him in Spirit and in TRUTH"
Sometimes young, enthusiastic politicians run for office by promising “Change” from previous political major mistakes. as all of the other "politically correct" compromisers of the TRUTH learned long ago (in order to stay in office). The Corruption Conundrum is that Compromising the TRUTH Perpetuates Great Evil, without making progress toward promised change. President Obama PROMISED To End All Pork-Barrel Earmarks (in order to balance the budget), but Barack Obama quickly broke that promise (and many others) by immediately signing 9,000 new fiscally-irresponsible deficit-spending earmarks into federal law (to accommodate great evil traditional political expediency). Our grandchildren will still be paying for Obama’s many broken promises long after he leaves office. We are $14 Trillion in debt, and still overspending more than any nation in history ever has before. 85% of Americans are very displeased. Corrupt incumbents in both parties are at jeopardy of losing their next election. (if the sad TRUTH is exposed to all voters). 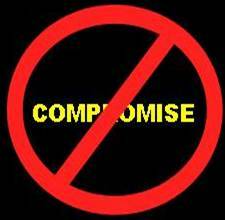 Our endless serious suicidal problems of today CANNOT BE SOLVED BY COMPROMISING SUSTAINABILITY. You cannot compromise on only half of the energy required to get to the moon and back. The Apollo Project was 6% of our national budget ($0.50 per person per day) - $125 billion in today’s dollars. Apollo caused us to advance from slide rules to today’s computers, Internet, GPS, and almost everything that is now packed with electronic intelligence. There were over $9 worth of immediate benefits for every $1 we spent on our aggressive, expensive space program. The Emerald Eco-City No Compromise Objective ZERO goals are far more important than Apollo “Man on the Moon” Ever Was. Our unprecedented Emerald Eco-City (world’s-largest-development-project) will provide the LARGEST SET OF BENEFITS TO HUMANITY of ANY project throughout human history – Far MORE than $9 ROI for every dollar we will soon spend. Hundreds of new Eco-Cities (one-to-ten million people living-and-working in each) MUST use the demonstrated Objective ZERO principles worldwide in only a few decades to avoid our current path toward the Suicide of Humanity. Our previous website material clearly demonstrated how desperately we need to develop-and-REFINE all of the Emerald Eco-City No compromise Objective ZERO details in only a few short years. It will take an unprecedented investment of money and time, BUT we do NOT want every new future 21ST Century Emerald Eco-City to have to reinvent this critical Objective ZERO wheel. It MUST be the world’s largest COLLABORATIVE design effort in history, with best-and-brightest input from many-different fields of expertise. AND Explain to your children that you selfishly do not give a damn about them! AND you believe that we must STOP compromising with suicidal crooks, then you are now one of our new Emerald Eco-City Friends. We would like to hear from you– What are YOUR questions? Please read on – We gladly share our thirty years of life’s loving work with you. Lifelong Learning In An Ever-Expanding Universe Of Endless Possibilities.